Star Kids Products is proud to introduce Snack & Play Travel Tray (Patent Pending), a unique and innovative product for families on the go. Snack & Play Travel Tray was created out of necessity for todays children. 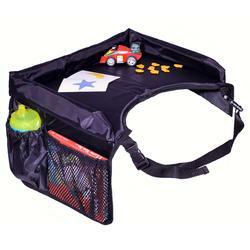 Snack & Play Travel Tray enhances the driving experience by providing a flat, safe area for children to eat and play. Snack & Play travel tray provides a sturdy surface for travel treats and toys, firm enough to eat on, play upon, read, etc. Tray buckles around the child, use with car seats, booster seats, strollers, on airplanes, in movie theaters, etc. Has 2" padded rim to keep toys and snacks on tray. Has two large mesh side pockets. Made of foam and nylon. Every parent knows that when children cant reach items, they become upset. Parents must stop the car, or reach behind in order to get the child the items they want. This inconvenience can cause delays, disruption, and stress. Snack & Play Travel Tray is ideal for short and long trips. Use Snack & Play Travel Tray anywhere you go with your car seat, even airplanes! Travel tray makes a great gift. Snack & Play Travel Tray can be purchased through our retail network.